SVG is profiling this year’s 11 Sports Broadcasting Hall of Fame inductees in the weeks leading up to the ceremony on Dec. 11 at the New York Hilton. For more information, CLICK HERE. “Hello, friends.” That’s far more than a calling card or a catch phrase. It’s a daily reminder that, in the sports-broadcasting industry, we’re family. For 35 years, Jim Nantz has been family to millions of U.S. television viewers who have welcomed the legendary broadcaster into their homes for some of sports TV’s biggest events, including countless NFL and March Madness games, as well as thrilling major golf tourneys. It’s a rare and special feat to achieve an entire career’s worth of successes at one network, but that is what Nantz has done. After graduating from the University of Houston and serving brief stints at CBS affiliates in San Antonio and Salt Lake City, he got his big break with the network. It was obvious from the get-go that he was where he belonged. 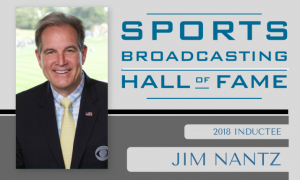 In his 34 years (and counting) at CBS, Nantz has, so far, been honored with three Emmy Awards and named National Sportscaster of the Year five times. He started at CBS as studio host of the network’s college-football coverage in 1985. He moved to the booth to call play-by-play in 1989 before moving to the NFL scene in 1991. By ’93, he was on the No. 2 NFL crew before becoming host of The NFL Today. In 2004, he went out on the road as the network’s lead voice for The NFL on CBS, calling four Super Bowls (Super Bowl LIII in February will be his fifth). Nantz’s class and style are forever engrained in the minds of fans of the Masters and the NCAA Final Four. It was fellow Sports Broadcasting Hall of Fame inductee Neal Pilson, then president of CBS Sports, who gave Nantz his shot at the tournament he loved, putting him up in the 16th Tower in Augusta to call the action in 1985. He has been an integral part of the iconic event’s coverage ever since. As for the Final Four, Nantz has leant his voice to the crowning of a college basketball champion every year since 1991, calling the action for many years with his counterpart Bill Packer. Over the past four years, he has been teamed with former NBA All-Star Grant Hill and Sports Broadcasting Hall of Famer Bill Raftery, who once compared Nantz’s style with that of Walter Cronkite. Nantz’s career has been marked by several extraordinary feats. Annually, he gets to take part in a week that any broadcaster would dream of: he goes straight from the Final Four to Augusta for the Masters. In 2007, in fact, he became the first broadcaster in history to complete what has been dubbed “The Triple”: calling the Super Bowl, the NCAA Men’s Basketball Championship, and the Masters — all within about 60 days. He has done that three more times and will do it again in 2019. His career has also given him the chance to call the shots at the US Open Tennis Championships for nearly a decade, broadcast from the booth of two college-football national-championship games (1996, 1997), and even host his network’s coverage of the 1998 Winter Olympic Games in Nagano, Japan. And, of course, there was his father, Jim: the man who was Nantz’s real hero and inspired his son’s iconic phrase. Leaving a visit with his father to go call the 2002 PGA Championship, Nantz explained to his dad, who was suffering from Alzheimer’s disease, that, when he opened the broadcast of that event with “Hello, friends,” he was talking specifically to him. For years and years, Nantz has extended that kind of hospitality to all of us, making us feel like his family and making us feel right at home, even on sports’ biggest stages.